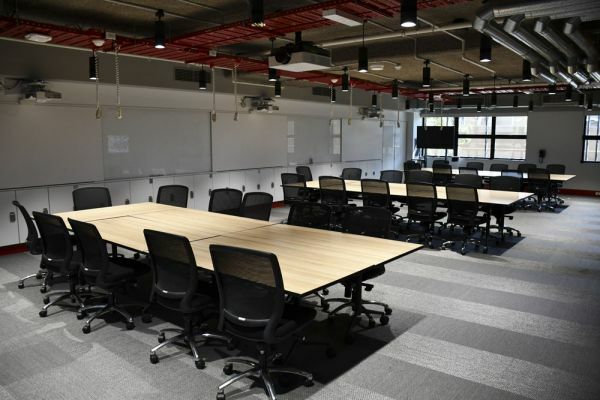 The Digital Lab (room 213-215) is suitable for large workshops, seminars, and small conferences or symposia. Capacity 30-50 people (depending on layout). There are four projectors in the Digital Lab that can be used in two modes: ‘Seminar Mode’ and ‘Collaborative Mode’. 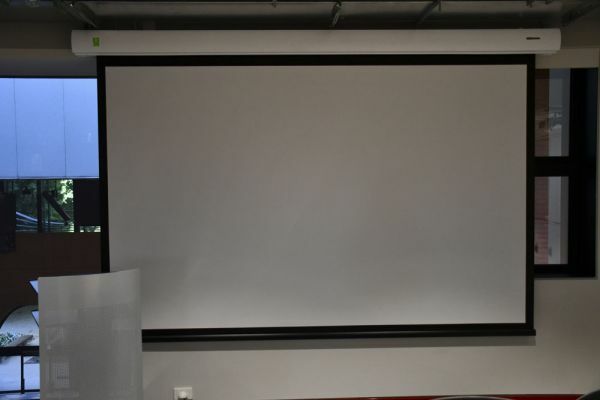 To select a mode and turn on the projectors, activate a touch panel (located at either end of the room) by touching the screen and select a mode from the start screen. Seminar Mode activates the large projector and screen at the eastern end of the room. 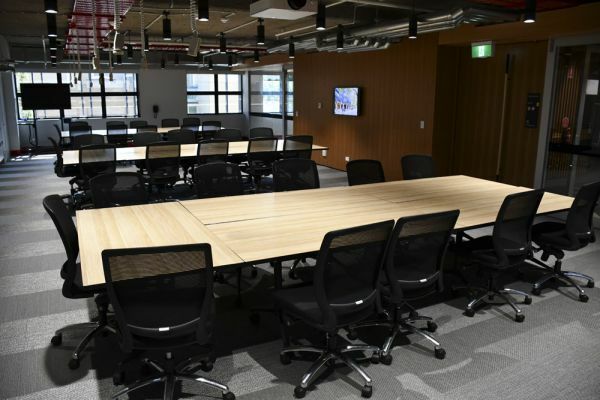 In Seminar mode you can choose between two sources, either the ‘PC-213’ (the top computer in the cabinet) or ‘Lectern Laptop’ (connect via cables near the window overlooking the Arts West Atrium). 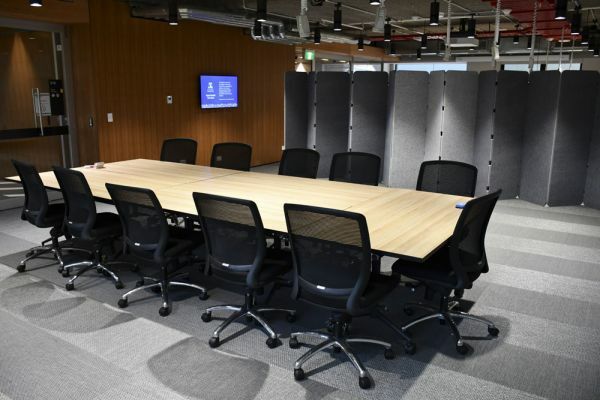 Collaborative Mode allows you to use the three projectors on the southern side of the room. You can stream content from one of the three local computers or your laptop (via HDMI cables hanging from roof) to any screen. If sound in the room is not playing, re-select the source connected to the device you wish to play sound from. Sound will always be played from the most recently selected source. There are three computers (running Windows), with wireless keyboards and mouse, located in the cupboard to the left of the screens on southern wall. These computers require a University of Melbourne log-in. 15 tables, 30 chairs, and a mobile lectern with projector connection are contained in the room. There are power outlets hanging from ceiling. Two large screens on trolleys also available, if requested. All tables and chairs can be reconfigured but should be returned to standard arrangement at conclusion of booking. Table and chairs can also be removed from the room if advanced notice (48 hours) is given. You can use your laptop to stream content onto the projectors in both Seminar Mode and Collaborative Mode. 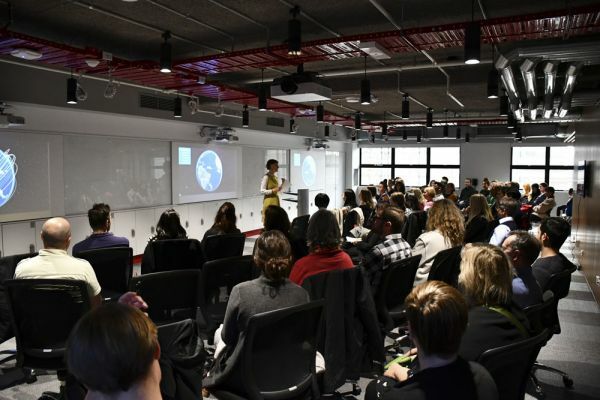 For Seminar Mode the laptop input is located with lectern on left of screen near the window overlooking the Arts West Atrium. In Collaborative Mode, laptops can be connected using the HDMI cables suspended from the ceiling above each of the table locations in front of the projectors. In Collaborative Mode all three inputs are HDMI only, Seminar Mode includes both HDMI and VGA connections – please bring your own adaptors. Some adaptors can be supplied by the Digital Studio if advanced notice (48 hours) is given. 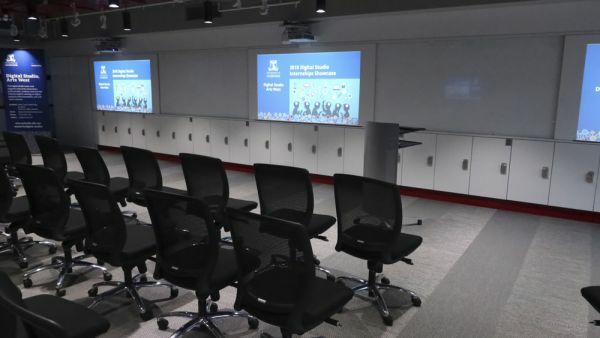 The projectors on southern wall can also function as interactive whiteboards. Stylus for controlling the computers in this mode are available in the cupboard to the left of the screens. If the stylus does not work straightaway, restart the ‘EyeRis’ software from the desktop. This functionality can be used with Zoom and StarBoard collaborative tools. Please use the ink whiteboard markers only on the glass panels not the white screens.